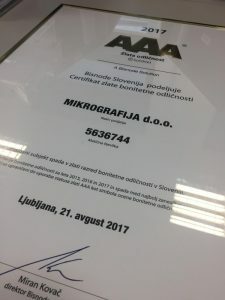 Mikrografija received the highest, Gold rating of Excellence, awarded by Bisnode. This award represents an above-average rating among companies, that have demonstrated a credit rating of excellence for three consecutive years. Companies that do business with abvove-average results and meet strict criteria to achieve low probability of occurance of negative events in the comming twelve months. Only 0,7% of companies in Slovenia reaches such rating, and we are proud to be a part of this golden pinch.